AISI 1045, medium carbon steel, has a tensile strength of 570 – 700 MPa and Brinell hardness ranging between 170 and 210. 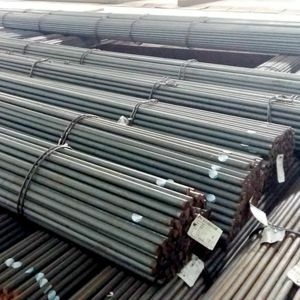 AISI 1045 carbon steel can give the advantages of good weldability, good machinability, and high strength and impact properties in either the normalized or hot forged condition. AISI 1045 carbon steel has a low through-hardening capability as suitable for tempering and through-hardening. However, it can be efficiently induction hardened in the normalized or hot forged condition to obtain surface hardnesses in the range of Rc 54 – Rc 60. AISI 1045 carbon steel lacks suitable alloying elements and hence does not respond to the nitriding process. The actual hot forging temperatures in closed die forging process will be decided by a number of factors, such as complexity of the forged part. Like AISI 1020 carbon steel, heat treatment may also be operated after forging to improve the properties of C1045 carbon steel forgings. Full annealing of C1045 closed die forgings is carried out from 1450-1600ºF (790-870ºC) followed by furnace cooling at 50ºF (28ºC) per hour, to 1200ºF (650ºC) soaking and air cooling. The normalizing temperature for this grade is typically 1650-1700ºF (900-925ºC). Normalizing is followed by cooling in still air. When forgings are normalized before hardening and tempering or other heat treatment, the upper range of the normalizing temperature is used. When normalizing is the final treatment, the lower temperature range is used. Hardening of this grade is carried out from an austenitizing temperature of 1475-1550ºF (800-845ºC) and oil or water quenching. Induction hardening may be carried out by heating quickly to the desired case depth and quenching in water or oil. This should be followed by a tempering treatment at 300-400ºF (150-200ºC) to reduce stresses in the case without affecting its hardness. A surface hardness of Rc 58 may be obtained by this treatment. AISI 1045 carbon steel forging is widely used for all industrial applications requiring more wear resistance and strength. Typical applications of AISI 1045 carbon steel forgings are as follows: rocker arms, connecting rod, torsion arm, ect.